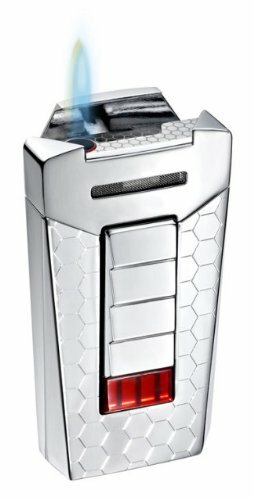 This lighter by Tonino Lamborghini has a stainless steel body with honeycomb etching. On the front it sports red garnet stones and stainless steel rectangular accents that double as the ignition. This dual ignition, single jet flame lighter also has honeycomb laser marks along the jet flame surface.